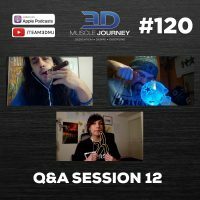 In this episode, Brad, Alberto, and Andrea finish off season 12 of the 3DMJ Podcast with a crowd-sourced Q&A. The team answers eight questions related to training, coaching, the fitness industry, and detaching your physique from your self-worth. In this Q&A, you will hear about the biggest changes the team foresees happening in bodybuilding/the fitness industry over the next five years, how to encourage an athlete to challenge themselves in the gym, tips for bringing up a lagging upper body, myo-reps, the phenomenon known as “muscle maturity”, and the necessity (or lack of) of vertical pressing for bodybuilders. Today’s episode is packed with lots of great information and tips for lifters of every experience level. Grab your popcorn, sit back, relax, and enjoy the conversation. 3:21- What do the coaches think will be the biggest changes in bodybuilding/the fitness industry over the next five years? 18:18- For bodybuilders, is vertical pressing “mandatory” or are lateral raises and rear delt exercises sufficient? 50:24- What are myo-reps? How do you count volume for myo-reps? 1:20:18- Is there any science to explain the phenomenon of “muscle maturity”? 1:28:12- How can self-coached individuals ensure they have good form on the big movements? Long term listener of podcast, avid M&S pyramid reader, and have newly acquired lifting library. Love your stuff and can’t get enough! I have a question for a podcast, obviously whenever there is a lot for it. I work very long days with varying shifts. I’m going back to my university hospital to further my training for the next year, potentially leading to a 3 year residency. During the next year I’ll have varying schedules each month, with 4 months of the year primarily dealing with out of hours work (I.e. night shifts). How would you suggest I best approach designing my program to be flexible enough so that I can train more on weeks where I’m better recovered and less on the more intense week? I was thinking about having a Push Pull Legs split that was just rolling. e.g. One week (less intense week with less sleep deficit) I may do P/P/L/P/R/P/R and the next L/R/R/P/P/R/Rest. Etc. Not having a set number of days per week but just getting in training when I can and focusing on good quality volume. Thoughts? Otherwise could do full body training? Thanks so much for being such an avid consumer of our content and lifting library! We’re so proud to hear it! And I have added your question to the Q&A bank that we keep for future shows. As you probably already know, we’ll be recording one of these shows at the end of every season (episode 130, episode 140, etc.) so that’s when the coaches revisit the bank for a few of these to answer. We appreciate you contributing!